Thanks a lot to Indiblogger and Dove for sending a great sample along with the pouch which really made my wife's day great. She was looking for a pouch to keep her cosmetics while traveling and Dove one really fulfilled the purpose. 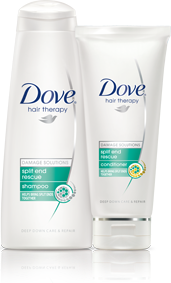 Coming back to the Dove Hair Therapy Shampoo and Conditioner having Split end rescue damage solutions really helped my wife's long hairs and she felt a great deal of split ends repaired with continued usage. We have been using Dove from the time my brother first brought it from Switzerland for my mom way back in 2008. We really liked the Shampoo and continued to buy it from Big Bazaar with our grocery shopping with the food coupons my company pays as part of my salary. Dove Hair Therapy as per my wife is really a great solutions which really makes your hair shine as well as increases it's strength. If you have problem of split ends then it's a necessity. Overall it's a great shampoo as always from the house of DOVE. Me and my wife have been a fan of Dove Shampoo's from 2008 and they are really the secret behind our beautiful hairs.